I just flew in from the Rio Grande Valley Birding Festival in Harlingen, TX and boy, are my arms tired. Actually, every bit of me is bone weary but it was worth it. The birding at this festival was epic, which is a term I don’t use lightly. This was due in no small part to the awesome array of avifauna in El Valle, as this floodplain is affectionately called. I’ll explain more about that, along with the remarkable places I visited and people I spent the week with, in time. To start, it might be best to offer some insight into what makes the Rio Grande Valley so unique among American ecosystems. You see, most feeders in the United States play host to dainty little chickadees, titmice, and finches. In RGV, on the other hand, that hooting and chattering in the backyard may very well be… CHACHALACAS! 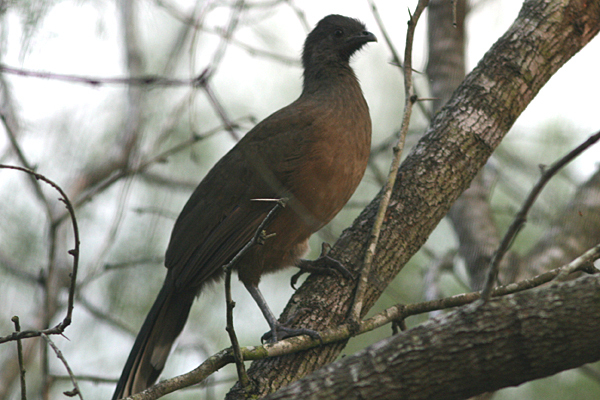 The Plain Chachalaca is a mighty member of the family Cracidae, the only one in fact that frequents the U.S. Like most of its chachalaca, guan, and curassow kin, Ortalis vetula is large and somewhat gallinaceous. While that bulky body, small head, and long tail tipped with white may call to mind turkeys, this avian has obvious arboreal tendencies, though it will come down for free food. Plain Chachalacas range throughout the southernmost reaches of Texas down through eastern Mexico and Central America all the way to Costa Rica. These omnivores favor riparian woodlands, thickets, and scrub. While they turn up in semi-arid areas, they do prefer habitat close to water. 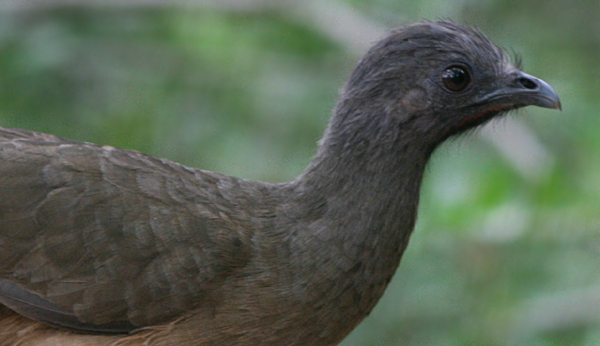 The name “chachalaca” is derived from the bird’s raucous call. Come dawn, dusk, or any other time the mood strikes them, troops of chachalacas might raise a cacophony reminiscent of barking dogs or chattering monkeys. These vocalizations, evocative of tropical jungles, are rarely described as melodious, or even pleasant! This particular species of chachalaca is, well, rather plain. Gray on the head blends to an olive back and buff belly, with an overall sienna wash. Apart from the ivory tail tip, this species’ most flashy feature, not always evident, is the crimson color of its bare throat. Well, that and the fact that it’s a giant grunting turkey-like bird determined to raid your backyard bird feeders. And you thought squirrels were bad! This post has been sbmitted to Bird Photography Weekly #12. Go check it out! Ah, so that’s what a chachalacas looks like. I’ve been waiting for some reports from you from the RGV. You gotta love Chachalacas! Nice post on a bird synonomous with the Valley. It was great birding with you and meeting you! Hey, nice post, Mike! It was great hanging out with you in the Land of the Chachalaca. I’ve been meaning to ask you: Why do you use that photo of Rick Astley for your profile shot? Sharon, the pleasure was mine! Bill, looks like you’ve been rickrolled! I could just up and eat these little chachas, they are so tender and cute. Thanks fer pluggin’ Bill and his bitter half. (cuz I missed all the phun in Tejas). Hope to run into you sooner than later. Welcome home! Excellent and super informative website. Your passion for birds is awesome. Believe me, Julie, you were missed in Texas. Bernie, thanks for the compliment. It does look like our brush turkey except much less colourful. Great post and interesting description. Nice pictures! I miss those birds already! My wife and I were in Brownsville early this year and we got a ton of lifers! Chachalacas are so much more than meets the eye. The take very good care of their young and when they have plenty of food and can have a third clutch the parents leave the teenagers to babysit the tiny ones. That is asight to see. I was lucky enough one year to see 10 babies from one pair. The parents paraded them for me one morning, while I was having my coffee on the deck, looking extremely puffed up and proud. The ones in my yard were so tame they would let me come outside and sunbathe with them. It is pretty funny to see them almost topple trying to get the most sun under their lifted wing. i have just hatched two babies from an abandoned nest..does anyone have a clue what to feed them besides chick starter..
does anyone know where I can obtain chachalaca eggs and if so do I need a state permit to raise these birds for release into the wild? I have raised a ton of pheasants and quail to release to the wild. Does anyone know where I can aquire chachalacas for breeding or eggs ? 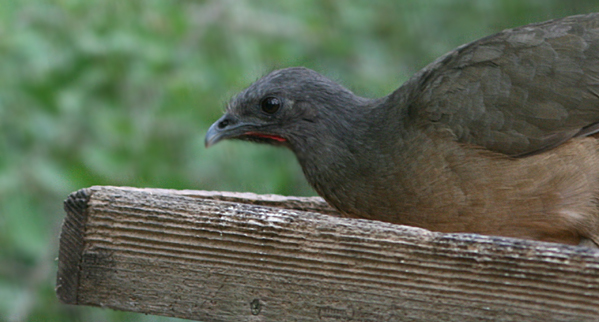 I just saw my first Chachalaca while birding down in Puerto Morelos, Mexico, on Christmas Eve day, 2010. very cool! I’m sorry for not posting for a long time. Those are good pictures! I like your article because you present the beautiful bird images. 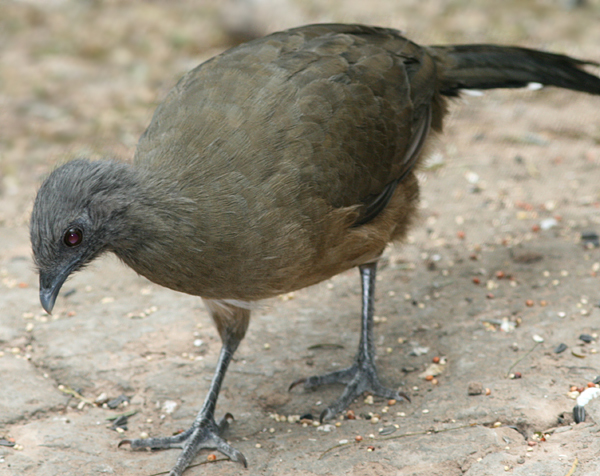 I also like the plain chachalaca birds photos.